This week's object is commonly known as the 'Dead Man's Penny'. 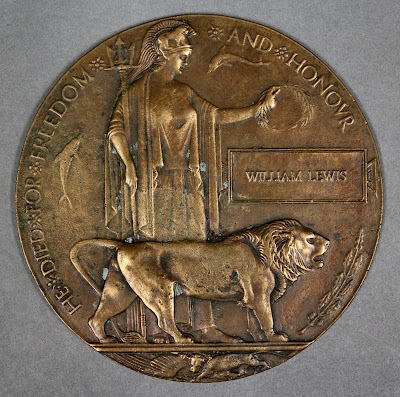 It is a memorial plaque which was issued after World War I to the next of kin of all those killed, in this case the family of William Lewis. It is made of bronze and is about five inches in diameter which gave it a resemblance to the penny coin, hence the name. William Lewis was born in Dungarvan to John and Mary Lewis, and was the husband of Mary Lewis of Davis Street, Dungarvan. He was a private in the Royal Irish Regiment, 2nd Battalion, service number 7288. He was previously with the Irish Guards. He enlisted in Dungarvan and was killed in action aged 26 on 24th August 1914. He is buried in St. Symphorien Military Cemetery in Belgium, grave or memorial reference II.B.13. The plaque was designed by sculptor and medallist Edward Carter Preston (1885-1965). The design depicts Britannia holding a trident beside a lion. The designer's initials are above the front paw. Britannia holds an olive wreath above a rectangular tablet which bears the name of the deceased. No rank is given as it was agreed that no distinction should be made between those who died. The plaques were cast at the Memorial Plaque Factory in Acton, London from 1919. The plaques continued to be produced into the 1930's. Along with the plaque the next of kin received a commemorative scroll from the King, and a letter.